A regular breeding resident and migrant found throughout the state. The Common Nighthawk was an uncommon species during the Minnesota Breeding Bird Atlas (MNBBA). Broadly distributed across North America, from the Yukon and Northwest Territories east to the Atlantic coast and south throughout the United States and portions of Central America. The Common Nighthawk is sparsely distributed throughout its breeding range but reaches its highest breeding densities in the southern Great Plains (Figure 1). Assigned a Continental Concern Score of 11/20 and identified as a Common Bird in Steep Decline by Partners in Flight; designated a Species in Greatest Conservation Need by the Minnesota Department of Natural Resources. No nest is built; eggs are laid on gravel beaches, outcrops, forest floors, and flat gravel roofs. Breeding distribution and relative abundance of the Common Nighthawk in North America based on the federal Breeding Bird Survey, 2011–2015 (Sauer et al. 2017). In the early 1900s, Roberts (1932) described the Common Nighthawk as a “common summer resident throughout the state.” He compiled confirmed nesting reports (nests with eggs) from 8 widely dispersed counties: Anoka, Grant, Hennepin, Isanti, Marshall, Meeker, Pipestone, and Polk. Reports of recently fledged young also were available from Cass, Lake, and Yellow Medicine Counties. Although subsequent accounts make no distinction among subspecies, Roberts (1932) pointed out that Minnesota’s nighthawk population was primarily comprised of two subspecies: Chordeiles minor minor, which occurred statewide but was particularly abundant in the eastern regions; and C. m sennetti, a paler form found primarily in the western prairies. A third subspecies, C. m. howelli, was also limited to southwestern Minnesota. All three subspecies are still recognized by taxonomists today (Brigham et al. 2011). For some reason not evident the Nighthawk is now a much less numerous nesting bird in Minnesota than it was formerly. It was never shot here for sport nor for eating, as it was in the south, and suitable nesting-places are just as plentiful as ever they were, but it has steadily grown scarcer and scarcer all over the state. In Itasca Park, where the bird is rarely seen during the summer, they begin coming about the middle of August and for two or three weeks thereafter there are days in which the air is literally filled with them. A similar decline in the nesting population was observed in Wisconsin. The nighthawk was probably abundant throughout the state before European settlement, even increasing when the extensively forested landscape was cleared (Cutright et al. 2006). Huge flights of fall migrants were observed in the state as early as 1843 but had diminished considerably by 1903. Although Roberts believed hunting was not a significant factor responsible for the decline in Minnesota, Cutright and his colleagues speculated that shooting birds during the huge migratory flights may have contributed to their decline. Such carnage was not unique to Wisconsin. Bent (1940) included accounts from the late 1800s of widespread persecution due to the misbelief that the bird was indeed a hawk and capable of taking young poultry. The Pennsylvania Game Commission even allowed a bounty on the bird. Decades later, both Green and Janssen (1975) and Janssen (1987) described the nighthawk as a regular summer resident throughout the state. Janssen documented nesting in 13 counties since 1970. The counties were primarily restricted to the southwestern, east-central, and northeastern regions of the state. Hertzel and Janssen (1998) later added 5 more counties to the compiled list. Field biologists with the Minnesota Biological Survey reported 84 breeding season locations for the Common Nighthawk. Although the records were widely scattered statewide, the species was largely absent from the Red River valley, from central Minnesota, and from counties bordering the Mississippi River from the Twin Cities south to the Iowa border (Minnesota Department of Natural Resources 2016). Meanwhile, a targeted nighthawk survey was launched by biologists with the Three Rivers Park District. Beginning in the 1980s, staff began to notice the disappearance of nighthawks from western Hennepin County. This prompted four volunteer statewide surveys, in 1989, 1990, and 1991, and again in 2001. The efforts in 1991 and 2001 also included a very intensive survey of western Hennepin County. Outstate, the survey effort in 2001 showed a small but nonsignificant decline in the number of stops where nighthawks were observed compared to the results obtained in 1991. Within the Twin Cities metropolitan region, however, the data revealed a significant decline. In 1991, nighthawks were observed at 23.8% of the stops; in 2001, nighthawks were observed at only 8.9% of the stops. In western Hennepin County, the observations declined from 6.5% of the stops in 1991 to 1.3% in 2001. The authors concluded that if the rate of decline continued unabated, nighthawks could become extirpated from the metropolitan region within the next decade (Carter and Gillette 2002). Nearly a decade later, during the Minnesota Breeding Bird Atlas, participants reported 274 Common Nighthawk records from 5.0% (235/4,747) of the surveyed atlas blocks and from 4.5% (106/2,337) of the priority blocks (Figures 2 and 3; Table 1). Breeding was confirmed in 15 blocks. Although sparsely distributed, records came from all regions of the state except the heavily cultivated Red River valley south of Marshall County. The birds were also reported from all 7 metropolitan counties but were noticeably absent from western Hennepin County. Overall, nighthawks were observed in 70 of Minnesota’s 87 counties and were confirmed nesting in 17 counties. Twelve counties were additions to the list published by Hertzel and Janssen in 1998; 8 of the counties were from 4 blocks that each straddled 2 counties along the Minnesota and Mississippi Rivers. Although the nighthawk’s overall distribution appears similar to that described nearly 100 years ago, it was not considered a common species during the atlas; the total number of records (274) categorized it as a relatively uncommon species. The land suitability model for the Common Nighthawk illustrates the contrasting habitats occupied by the species (Figure 4). Its adaptability to rooftops in cities and small towns throughout the state is depicted by the high suitability of habitat in the Twin Cities metropolitan region as well as in small towns and cities statewide. On the other hand, open landscapes created by natural disturbances and timber harvesting activities in the most extensively forested landscape of northern Minnesota also provide suitable habitat for nighthawks. Beyond Minnesota, the Common Nighthawk’s breeding distribution has changed little over the years. Despite declining populations, Wisconsin found the species to be widely distributed throughout the state during their first statewide atlas (Cutright et al. 2006). In Ontario, Michigan, and Ohio, where second atlases have been completed, the species remained widely dispersed, but the number of detections declined significantly (Cadman et al. 2007; Chartier et al. 2013; Rodewald et al. 2016). In Ohio, for example, the occurrence of nighthawks in priority atlas blocks decreased 67% between the first atlas (1982–1987) and second atlas (2006–2011) (Rodewald et al. 2016). Breeding distribution of the Common Nighthawk in Minnesota based on the Breeding Bird Atlas (2009 – 2013). Summary statistics of observations by breeding status category for the Common Nighthawk in Minnesota based on all blocks (each 5 km x 5 km) surveyed during the Breeding Bird Atlas (2009-2013). Summary statistics for the Common Nighthawk observations by breeding status category for all blocks and priority blocks (each 5 km x 5 km) surveyed during the Minnesota Breeding Bird Atlas (2009-2013). Landcover suitability of the Common Nighthawk in Minnesota based on habitat, landscape context, and climate data gathered during the Minnesota Breeding Bird Atlas (2009-2013) using the MaxEnt modeling approach. Natural habitats occupied by Common Nighthawks are quite variable and include coastal sand dunes, beaches, rock outcrops, grasslands, and cultivated fields. Even forests are used when they have been disturbed by clearing or burning, creating patches of bare ground that are available, at least temporarily, for nesting (Figure 5; Brigham et al. 2011). A recent study in Ontario found nighthawks using recent clear-cuts, recent burns, and open wetlands in the extensively forested regions of the province (Farrell et al. 2017). Atlas observers in both Michigan and Wisconsin have noted that local concentrations of nighthawks are often associated with landscapes where drier soils predominate, supporting upland communities of pine or pine-oak barrens (Chartier et al. 2013; Cutright et al. 2006). It was not until the middle of the 19th century that nighthawks began to inhabit towns and cities as flat graveled rooftops became a more common form of construction. Indeed, Bent (1940) reported that as early as 1869 nighthawks were found nesting on warehouse rooftops in Philadelphia. This habit prevailed for decades until construction standards changed from flat gravel roofs to flat smooth or rubberized roofs, which do not have the same appeal (Marzilli 1989). Typical breeding habitat of the Common Nighthawk in Minnesota (© Jarad B. Niemi). Due to its crepuscular habits, the Common Nighthawk is not particularly well surveyed by the federal Breeding Bird Survey (BBS). Yet the BBS remains the source of the only long-term monitoring data available for the species. BBS data have been used to generate a global population estimate of 16 million birds (Rosenberg et al. 2016); the statewide estimate for Minnesota is only 9,000 birds, or 0.10% of the total population (Partners in Flight Science Committee 2013). The small statewide population reflects Minnesota’s location in the far northern reaches of the species’ range, where densities are quite low. The core of the nighthawk’s breeding range is much farther south, where there are particularly high numbers in the northwestern and southeastern regions of Texas, western Oklahoma, and central Kansas (Figure 1). Here the average number of nighthawks observed each year on BBS routes averages 10 to 12 birds per route. In Minnesota, the average number is less than 1 bird per route (Sauer et al. 2017). Since the BBS began in 1966, the survey-wide data demonstrate a long-term, statistically significant population decline of 1.93% per year. The rate of decline has slowed to 0.47% per year since 2005 (Figure 6). Biologists estimated the North American population has experienced a cumulative decline of 58% since 1970 (Rosenberg et al. 2016). 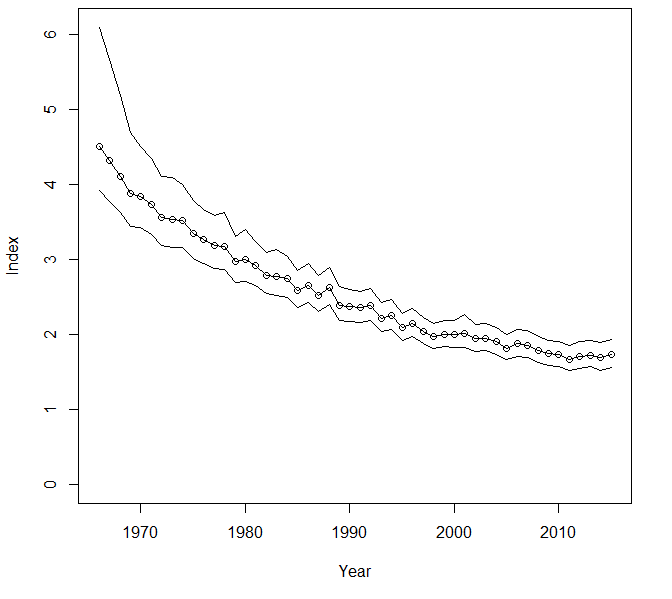 Although the trend lacks statistical precision, BBS data in Minnesota also suggest a long-term decline (Sauer et al. 2017). In light of the difficulty of monitoring the crepuscular nighthawk, confidence in overall population trends is somewhat tentative. Regardless, accounts clearly document notable declines in some areas. Canada, for example, has listed the species as a federally threatened species, and several northeastern states consider it a critically imperiled species (Brigham et al. 2011). One conservation organization, the Center for Conservation Biology, launched the Nightjar Survey Network in 2007 in an effort to address the inadequacy of current survey efforts. Like the BBS, it relies on volunteers to conduct nighttime surveys once each summer along predetermined routes (http://www.nightjars.org/about/about-the-nightjar-survey-network/). Unfortunately the level of participation in Minnesota has been too low to provide a solid foundation of data for detecting trends. One of the most impressive aspects of the Common Nighthawk’s life history is the spectacular flights during fall migration. With such a long distance to travel to reach their wintering grounds in South America, migratory flights begin as early as late July in the more northern latitudes, including Minnesota (Brigham et al. 2011; Janssen 1987). Some of the largest concentrations of migrating nighthawks have been observed along the North Shore of Lake Superior. The largest flight on record occurred on the evening of August 26, 1990, when 43,690 nighthawks were observed flying over the Lakewood Pumping Station on the northern outskirts of Duluth (Hendrickson and Eckert 1991). Several years later, in 2007, the Hawk Ridge Bird Observatory launched a systematic count of nonraptors, including Common Nighthawks, to complement the work under way for decades on raptors. High daily counts have usually ranged from 1,000 to 5,000, but in 2013 the second highest daily total of 30,874 birds was reported (Budde et al. 2014). Average annual counts from 2007 to 2011 averaged 5,773 birds (Bardon 2012). As the years progress, these annual counts may be one of the most robust indices of Common Nighthawk population trends. Factors responsible for the Common Nighthawk’s decline are not well understood. Declines in urban areas may indeed be attributed to changes in roof construction. Marzilli (1989) speculated that new, uniformly colored rubber rooftops may not provide the camouflaged background preferred by the birds. The smooth surface also makes it more difficult for the eggs to stay in one place, while the rubber’s hotter surface may be too warm for safely incubating eggs. A great deal of attention has focused also on the plight of the entire suite of aerial insectivores. As Nebel and his colleagues (2010) pointed out, population declines among this guild of birds are significantly steeper and more significant than those reported in other passerine birds. Population declines were steepest in the northeastern United States, where human population densities are high and industrial development is widespread. The resulting increase in atmospheric pollutants and their negative impact on aerial insects may be a strong factor in causing the declines of aerial insectivores. Studies have also investigated the competition for aerial insects between nighthawks and bats. Results suggested that bats may outcompete nighthawks for food resources, placing additional pressures on the nighthawks when prey populations are low (Boyce 1980; Shields and Bildstein 1979). Breeding population trend for the Common Nighthawk in North America for 1966–2015 based on the federal Breeding Bird Survey (Sauer et al. 2017). In light of the Common Nighthawk’s population decline, Partners in Flight has designated it a Common Bird in Steep Decline and assigned it a Continental Concern Score of 11/20 (Rosenberg et al. 2016). The species’ decline also prompted its designation as a Species in Greatest Conservation Need by the Minnesota Department of Natural Resources (2015). In addition to the concerns related to insect abundance, warming temperatures may also pose a challenge to nighthawks. An assessment by the North American Bird Conservation Initiative in 2010 assessed the species’ vulnerability to climate change as moderate. Despite its well-documented decline, conservation measures for the species are limited. The general focus, as demonstrated by the Nightjar Survey Network, is to improve understanding of the species’ distribution, abundance, and life history. Brigham and his colleagues (2011) note the urgent need for research directed at the species’ population status and conservation needs. The only specific management tool that has proved successful is the establishment of gravel pads on newer, nongravel roof surfaces in order to attract nesting birds (Marzilli 1989). Bent, Arthur Cleveland. 1940. Life Histories of North American Cuckoos, Goatsuckers, Hummingbirds, and their Allies (Orders Psittaciformes, Cuculiformes, Trogoniformes, Coraciiformes, Caprimulgiformes, and Micropodiiformes). Smithsonian Institution Bulletin 176. Washingon, DC: U.S. National Museum. Carter, Carol W., and Laurence N. Gillette. 2002. “Common Nighthawk Population Decline in the Seven County Metropolitan Region.” Loon 74: 3–7. Hendrickson, Mike, and Kim R. Eckert. 1991. “A Record Movement of Common Nighthawks.” Loon 63: 68–69. Marzilli, V. 1989. “Up on the Roof.” Maine Fish and Wildlife 31: 25–29.